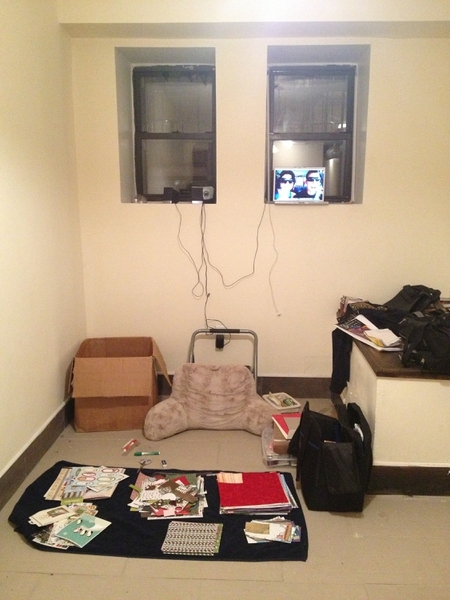 Pic 1: When I first moved into the apartment in Brooklyn, we didn't even have a kitchen table. So my scrapbooking was done on the floor by the front windows. Also we live in a basement so the floor is always dirty, which is why my paper is laid out on a towel. Another thing, we didn't have internet yet. But if you put your computer in the window you could pick up a signal from a neighbor somewhere. Which is why my computer is sitting in the window.Pic 2: I've upgraded to a table! On Black Friday I ran down to Home Depot and grabbed this folding table and set it up in our back storage area of the apartment. We now have internet, but no wireless router. Thats why there is a cord plugged into my computer and the internet is sitting on the de-humidifyer.Pic 3: Today! Trusty Home Depot! I grabbed some shelving materials from them today and built this unit. I've also collected a few more organizational pieces for my scrappy stash.For those of you who know me and my journey, this is nothing compared to what I used to have at home in CA. But I'm getting there slowly! !